DeLonghi recently launched their stylish Vintage 90DF Twin range in Slate, and it has proved so popular that the first batch to arrive in the UK has almost sold out. Once they are gone, the new batch won't be available until the new year, so please give us a call to order now and guarantee pre-Christmas delivery. Sporting two multifunction ovens, including a rotisserie function in the smaller cavity, the Vintage 90DF Twin is a highly versatile range cooker. The seamless, one-piece hob features a powerful 4kW wok burner and comes complete with wok support ring included. Finally, the cooker features desirable finishing touches more often found on more expensive models, such as metal controls and telescopic shelves in the main oven. 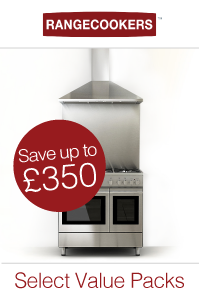 All in all, it offers fantastic value for the serious cook. What's more, if you order in November you will receive a free matching width Rangecookers splashback in either black or stainless steel.